PDF Focus .Net - simplifies PDF to HTML converting to several C# code lines! Without belaboring the point, let's see how to add "PDF to HTML feature" into any .Net application. First of all, to give your .Net application ability to convert PDF to HTML, add a reference to the "SautinSoft.PdfFocus.dll" assembly. You may download it here, 86.3 Mb. 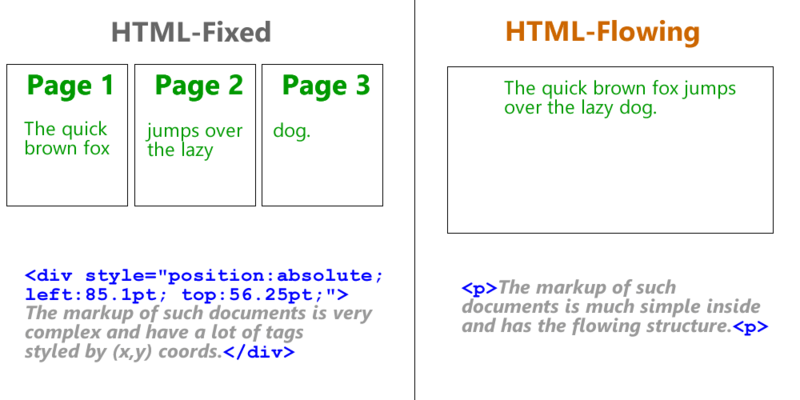 HTML-Fixed is better to use for rendering, because it completely repeats the PDF layout with the structure of pages. The markup of such documents is very complex and have a lot of tags styled by (x,y) coords. HTML-Flowing is better for further processing by a human: editing and combining. The markup of such documents is much simple inside and has the flowing structure. It's very simple for understanding by a human. Another point of interest, PDF Focus .Net can generate HTML documents with images embedded using base-64 algorithm. Given this fact, you can convert PDF to HTML completely in memory without HDD. All HTML documents produced using SautinSoft.PdfFocus.dll are completely compatible with W3C standards W3C Markup validation service. You have a question, need a support or a code example: ask our support team at support@sautinsoft.com. We will help you quickly and with pleasure. Save time and cost of the product development. The writing of own PDF converter in C# requires a lot of days of hard work and takes approx 100 000 C# code lines. PDF Focus .Net will save a lot of my time and I'll need only to add the reference to "SautinSoft.PdfFocus.dll" and write 3-4 C# code lines. 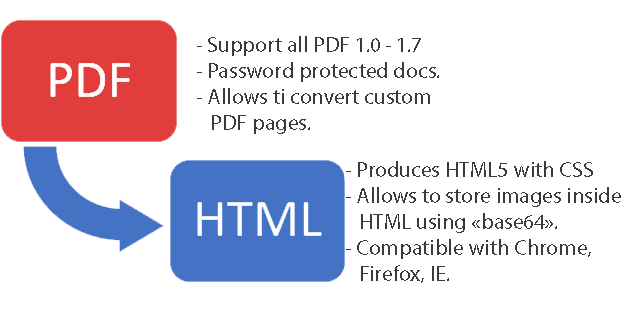 The one product provides me by set of API to convert PDF at various formats at once: Word, DOCX, RTF, Excel, HTML, Text, Multipage TIFF, Jpeg, PNG. Because of this is absolutely standalone PDF library, my clients don't need to have Adobe Acrobat, MS Word, Excel or other software. My software will have the one of the fastest API to convert PDFs inside, you may check this. I can select the any of product editions: Total, Office, HTML and Picasso. This saves my money. Let's us say, that I'm looking for only the API to convert PDF to HTML and don't need other features. Given this point, I can purchase the "HTML" edtion of PDF Focus .Net. It's much cheaper than competitor's price. The one time price. I pay a one time and can use «PDF Focus .Net» for a whole life without any additional fees. My license will never expires. As bonus, I get unlimited technical support during a whole life for free and independently of the date of my purchasing. If anyone needs a code sample in C#, VB.Net, ASP.Net etc "How to convert PDF to HTML", email us at support@sautinsoft.com or ask at Online Chat (right-bottom corner of this page). We'll help you certainly! Requires only .Net 4.0 or higher. Our product is compatible with all .Net languages and supports all Operating Systems where .Net Framework and .Net Core can be used. Note that PDF Focus .Net is entirely written in managed C#, which makes it absolutely standalone and an independent library. .Net Framework 4.0, 4.5, 4.6.1 and higher. The old version for old .Net 2.0 can be found here. The library offers developers the high quality conversion at reasonably prices. The main point of interest is that PDF Focus .Net is less expensive than all of its more or less popular counterparts. For example, a single license for PDF Focus .Net - HTML Edition cost $399 and the Total Edition starts from $578. To see this functionality firsthand, download the freshest «PDF Focus .Net» with code examples, 86.3 Mb.